The Association of Indians in America, NY Chapter (AIA-NY) raised $40,000 at its fund raising event “Spread Hope” for Project India at the Marymount Manhattan College, in New York City on Saturday, June 9. 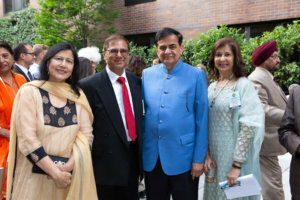 The event was attended by an elite crowd of over 250 people; including prominent individuals such as Padma Shri Dr. Sudhir Parikh, founder and chairman of Parikh Worldwide Media, his wife Dr. Sudha Parikh, Consul General Ambassador Sandeep Chakravorty, who was the chief guest, Dr. Dattatreyudu Nori, Kalpana and Amit Doshi, and Asmita and Arun Bhatia. At the event, the Project India team shared its journey, which had a humble beginning about 10 ten years ago, in response to the rampant spread of HIV/AIDS in India. Consul General Chakravorty engaged the crowd with his personal story and admiration towards the Association of Indians in America and its efforts with Project India. In the past decade, AIA’s partnerships with a renowned NGO called Gujarat AIDS Awareness and Prevention (GAP), located in Ahmedabad, and supported by a group of Physicians of the Brooklyn Hospital, have made immense strides in making a measurable difference in the lives of thousands in rural and tribal villages. 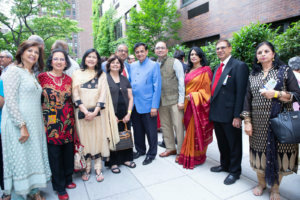 From L to R: Asmita Bhatia, Indu Jaiswal, Sudha Parikh, Dr Urmilesh Arya, Dr Jagdish Gupta, Padma Shri Dr. Sudhir Parikh, Consul General Sandeep Chakravorti, Mrs. Taruna Chakravorty, AIA NY President Gobind Munjal, Usha Kapoor. Programs have evolved as the team gained more experience and the attention today is on Comprehensive Healthcare of Women and Children. The program today serves over 2,000 families across 80 rural and tribal villages along the border of Gujarat and Rajasthan, which have minimal access to medical care. 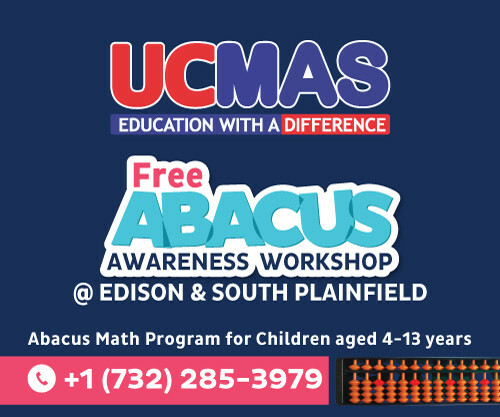 Programs are monitored, evaluated and refined to align with the need and outcomes. The visual presentation at the event highlighted key programs of Project India. 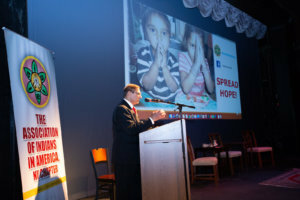 The scope, scale and significant results in “Spreading Hope” awed all in the audience. Annual Medical Camps, Teachers Training, Mamta Day (Women’s Health Checkup) Bal Gopal/Bal Mukul (Orphans living with HIV/AIDS) and Prevention of HIV from mother to child were cited to be most effective. Project India team member Asmita Bhatia emphasized that the results are encouraging due to the dedication of trained workers, earned trust of the villagers and local Panchayats and school authorities. The evening also included a musical theater with its North American Premiere, called Three Women, written, directed by Isheeta Ganguly. The play was based on the character of Rabindranath Tagore, showcasing the dilemma of women in the past and the present. 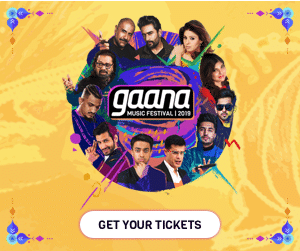 All actors Avantika Akerkar, Mahima Saigal, Zayn Marie Khan; narrator Samrat Chakrabarti and musician Abhishek Chauhan did a tremendous job and garnered a standing ovation. AIA New York Chapter President, Gobind Munjal, reminded the crowd that AIA’s 31st Deepavali Festival is on Sunday, Oct. 7 at South Street Seaport.